July 25th is the Memorial of St. Christopher, patron saint of travelers. 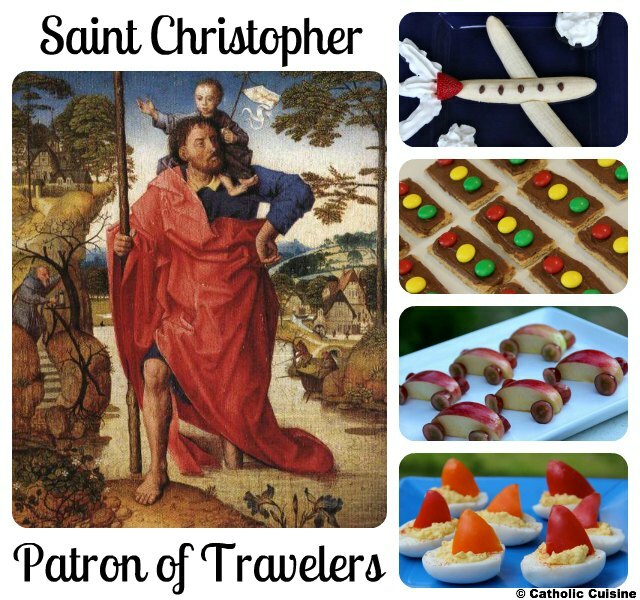 I'm planning on having a Transportation Themed Snack Time for my kids, in honor of this dear saint, which we will enjoy while reading The Legend of St. Christopher. I just know my kids are going to love the snacks, and I love that they are all healthy, made with (mostly) real food, and yet are still fun and colorful! Update: You can see additional pictures here. I ran across an idea earlier today (via a google search for airplane snack ideas) and made a trial version this evening. It was very easy to make and turned out so cute. I know these are going to be a hit! Slice banana in half lengthwise. Take one of the halves and slice it at a slight angle about 2/3 of the way through. 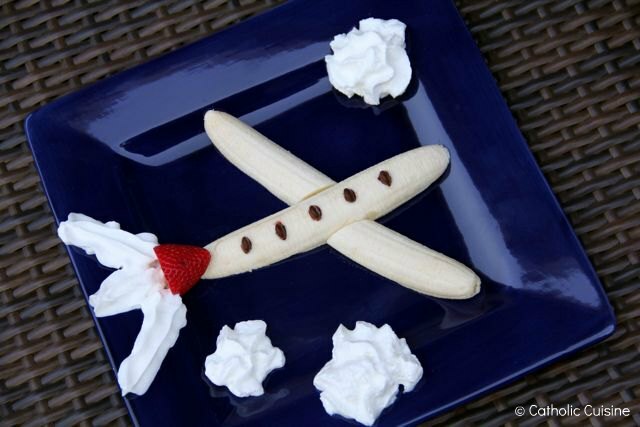 Arrange the banana pieces on a plate to look like a plane. Add the Mini M&M's for the windows, a strawberry for the tail, and whipped cream for the jet stream and clouds. 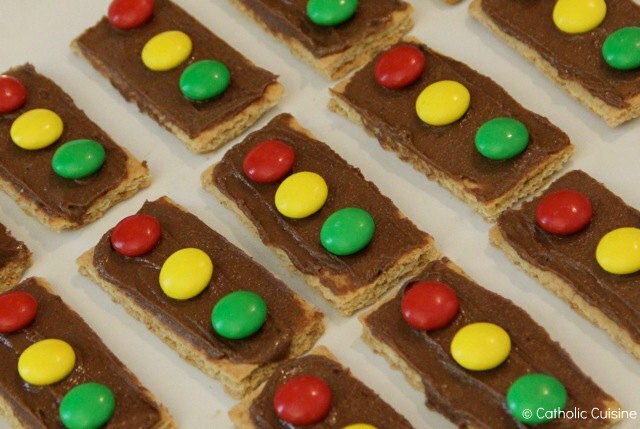 I made these little stop light snacks for my son's recent Cars themed birthday party. The kids loved them so much that I think I am going to make them again in honor of St. Christopher. Mix some cocoa powder into peanut butter. (I just added a spoonful or so.) Break Graham Crackers into quarters and spread peanut butter mixture on the top of each cracker. Add a Red, Yellow, and Green M&M to complete the stoplight. *If you wanted to skip the M&M's, you could always make these with Strawberry, Apricot, and Kiwi Slices! I also love the idea for making stoplights with celery sticks, cream cheese, and red, yellow and green bell peppers, cut into circles! I first saw this idea on Pinterest, originally from BentOnBetterLunches, and finally had a chance to try them! 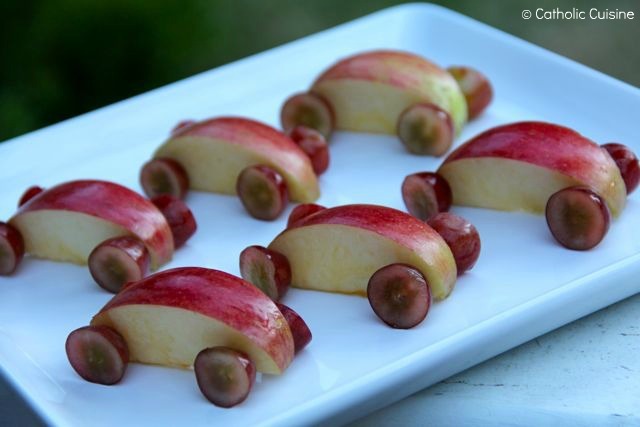 This is yet another super cute snack that the kids will love and is still completely nutricious! For each apple wedge, slice 2 grapes in half, widthwise. Push the pick through one end of the apple and add one grape to each end of the pick, sliced side out. Repeat with the other end of the apple wedge, adding 2 more grape slices. 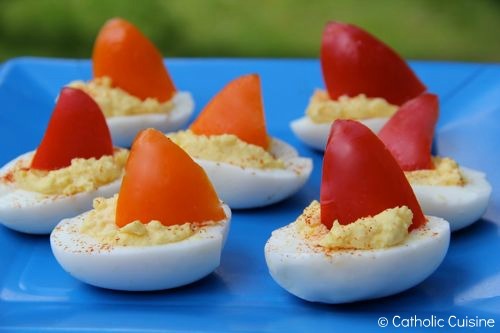 We made these Deviled Egg Boats last year for one of our Good Shepherd Garden Parties. They would be a perfect snack for the feast of St. Christopher! Peel the eggs, then slice each one in half to make boats. Place the yolks in a medium-sized bowl and mash them with a fork. Add the mustard and the vinegar, then add the mayonnaise, stirring until the consistency is smooth but not soupy. Next, make the sails. To do this, cut each pepper into 1-inch-wide strips, then cut the strips into 1-inch squares and slice each square in half diagonally. Fill the egg-white halves with the yolk mixture. Stick the sail upright into the filling and sprinkle with paprika. Makes two dozen. I've just written a novel, St. Anne's Day, a romantic comedy with a Catholic flair, and I'm releasing the book this week. As I was researching to see if there was any food associated with St. Anne for the blog posting for the launch, and I found your amazing site. I would like to put your link in my next blog post, if that is ok with you. There are some fun ideas for the feast of St. Anne in the archives! You are welcome to share links to the blog (and or posts), if you'd like.